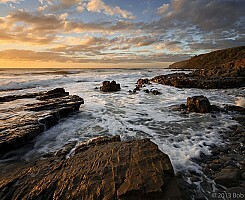 The coastline is a fundamental part of Australian culture and identity - most of us live near it, and if we don't, we probably will in our retirement. 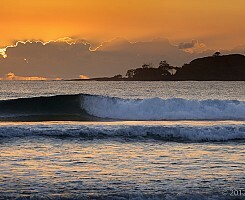 It is a place of nation-defining recreational opportunities and of immense aesthetic appeal - if we aren't surfing, fishing or swimming in it, there's a good chance we'll be spending time appreciating its natural beauty and power. 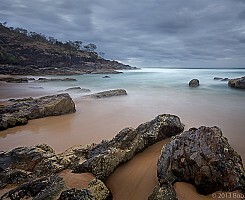 Like a lot of Australians who grew up in a rural setting, the annual holiday to the beach was for me a time of unbounded excitement and happiness. 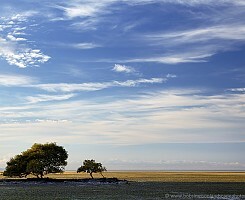 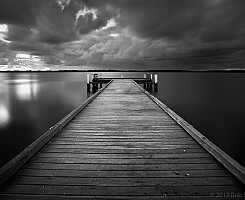 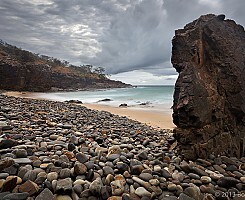 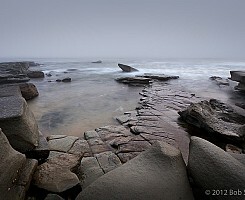 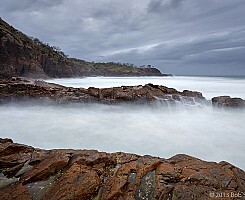 This gallery is my homage to the outer fringe of the Australian continent. 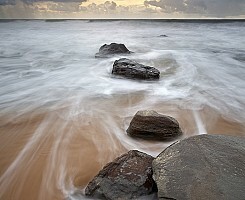 Thanks to Darren Robinson for suggesting the title. 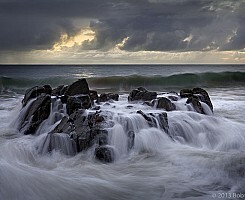 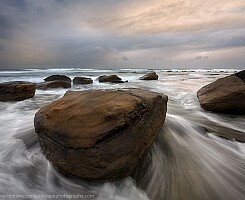 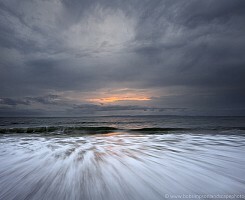 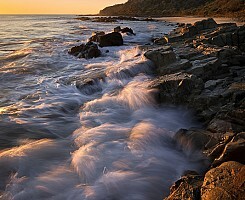 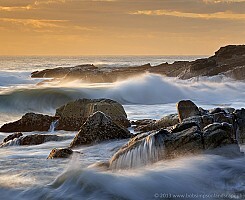 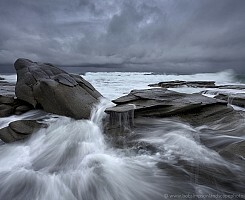 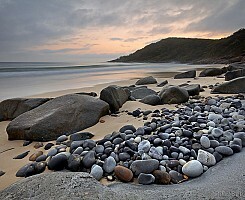 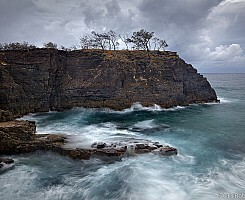 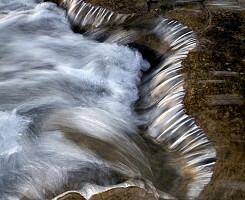 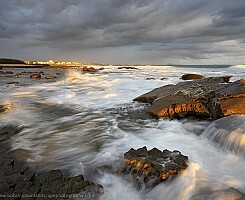 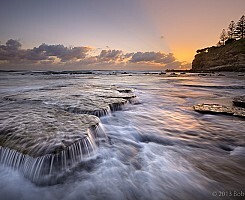 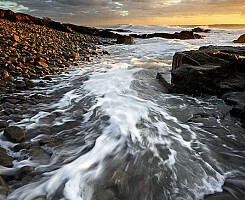 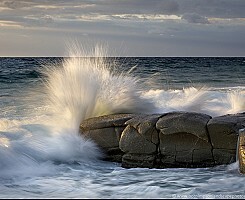 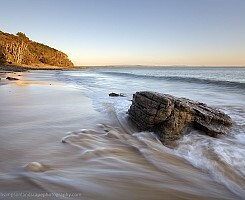 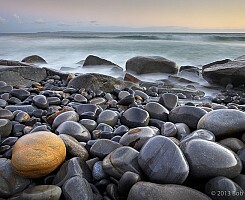 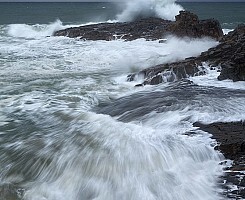 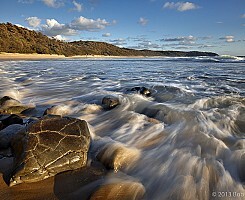 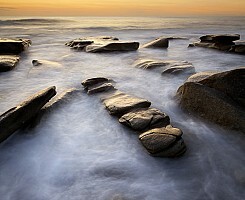 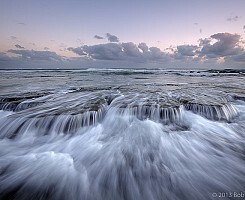 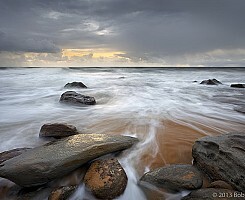 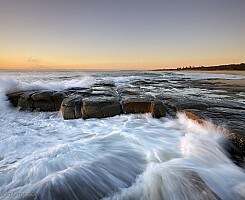 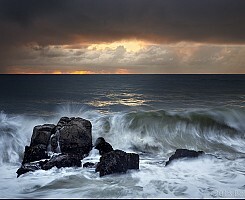 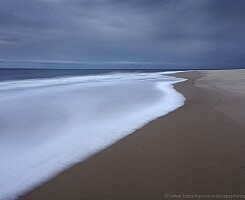 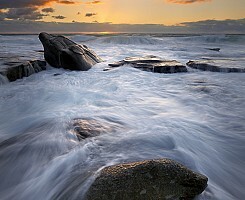 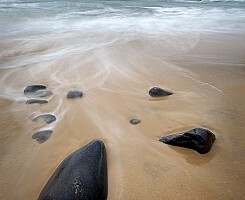 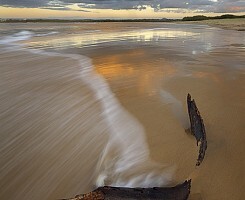 The choice of shutterspeed has a huge bearing on the appearance of moving water in images. 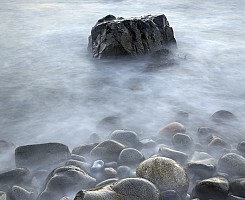 In a lot of cases I prefer a slightly faster shutterspeed than this to retain more detail in the water, but in this case, the four second exposure created a dreamy feel that I felt complemented the light and the sharp outlines of the rocks. 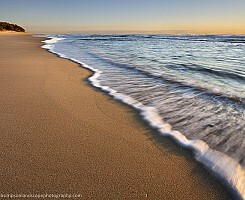 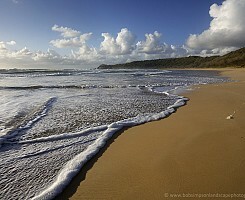 Early morning is just a beautiful time to be on the beach. 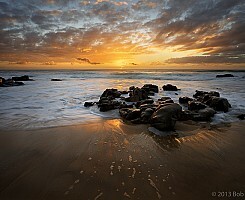 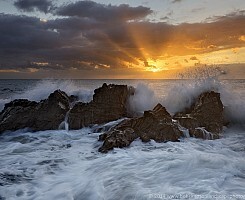 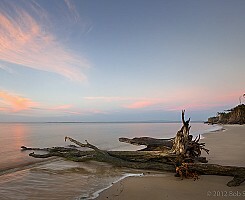 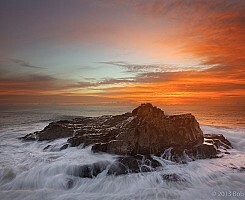 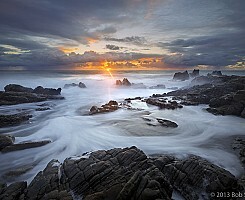 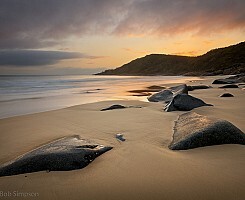 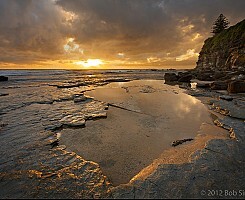 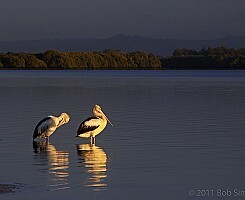 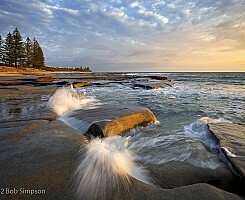 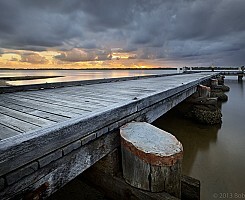 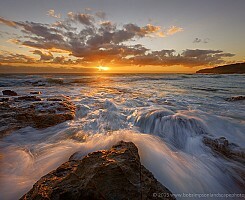 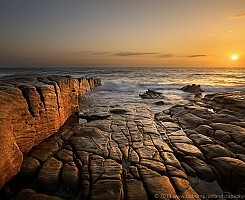 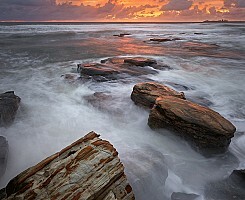 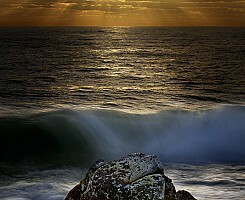 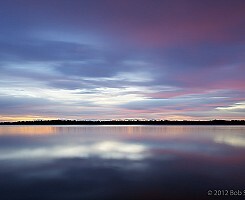 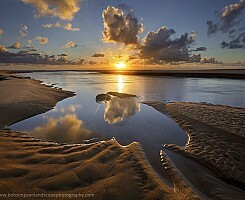 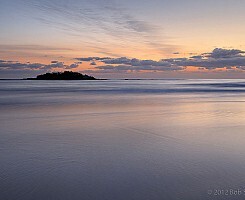 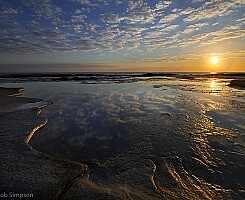 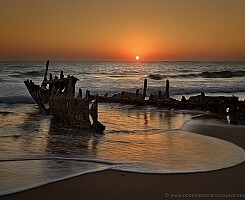 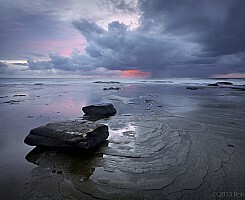 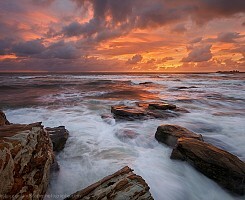 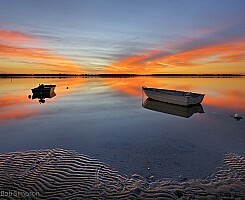 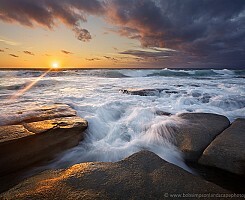 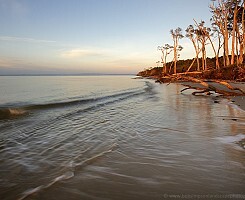 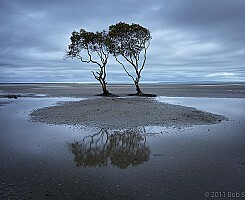 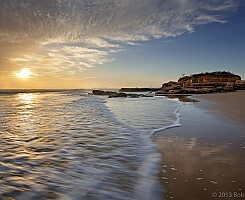 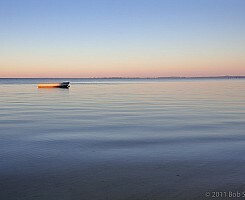 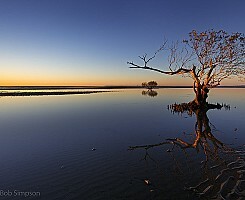 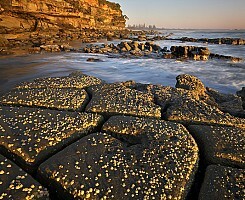 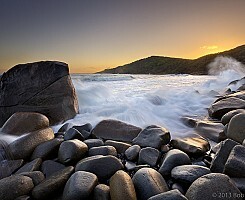 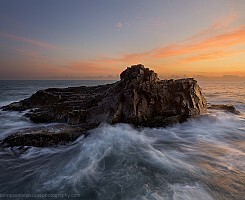 I shared this sunrise at Pincushion Island with one other photographer, but there was no competition for space. 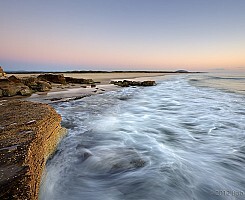 He was intent on capturing the view to the south as the first rays of sunlight reflected off the waterfront buildings at Cotton Tree and Alexandra Headland, while I was really taken with these soft colours and the empty stretch of beach to the north. 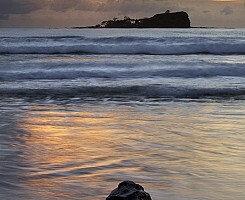 Mudjimba Island, a.k.a Old Woman Island, makes a strong and interesting silhouette for early morning beachscapes like this. 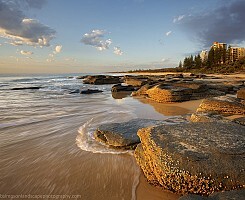 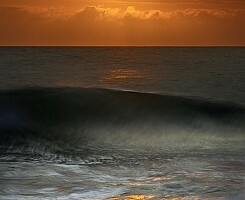 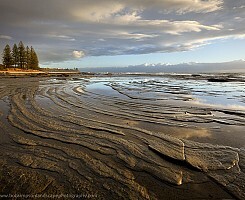 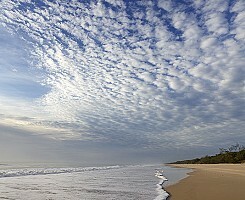 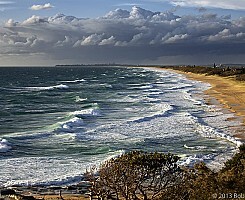 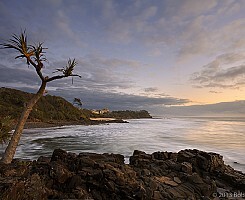 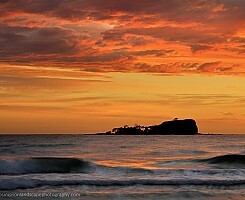 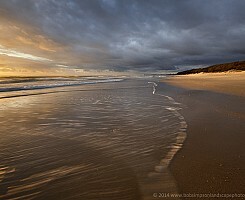 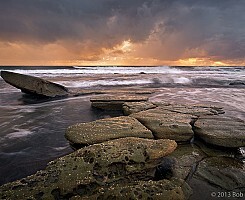 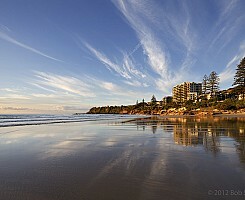 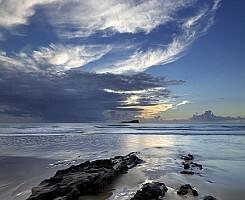 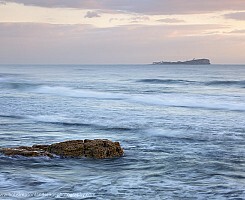 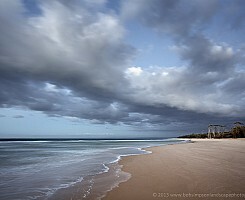 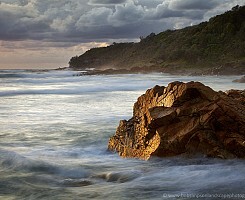 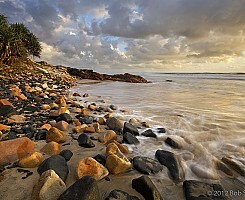 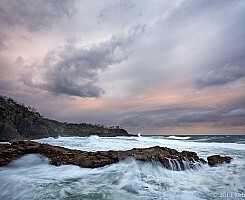 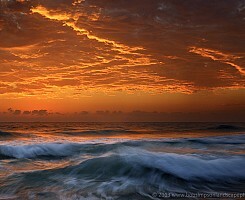 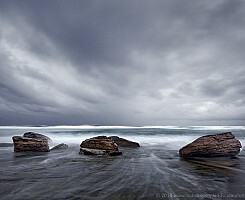 The gold-lined cloud bank was a real bonus, and the breaking wave identifies Mudjimba Beach as a popular surfing spot. 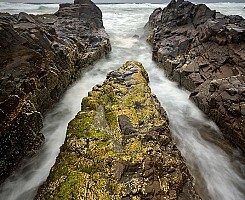 Every wave breaks differently and creates unique patterns as it washes over the rocks, so if I find a composition I like, I always take multiple shots so I can choose the best one later. 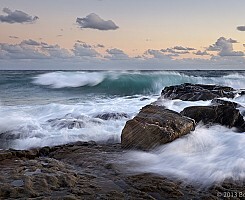 I had four variations of this image but this was easily the best - the main wave pushed right up into the little cove to create the spray at bottom right, while a smaller secondary wave was hitting the outer rocks to the left. 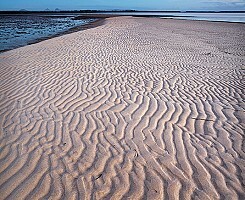 New patterns appear on this sand-bank after every high tide - you could photograph it every day and it would never look quite the same. 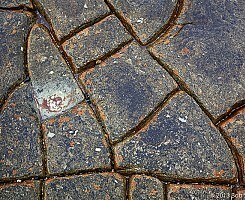 I find these patterns mesmerising, and can easily spend a morning wandering among them looking for new photographic angles. 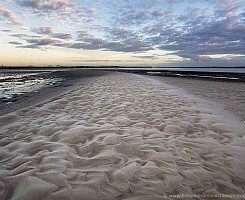 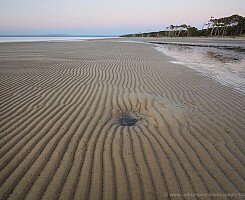 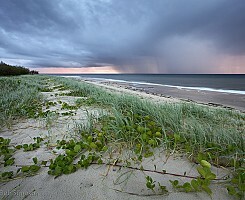 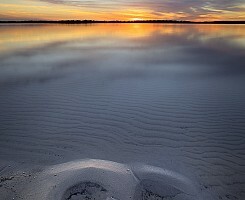 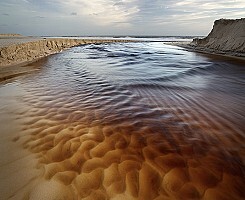 The protected tidal waters of Pumicestone Passage shape and decorate the expansive sand banks with all manner of patterns and textures. 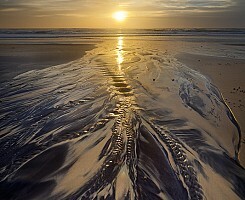 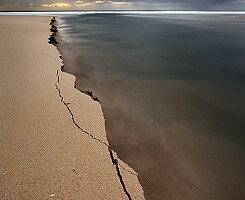 Early morning is the best time to discover the newest sand-art on display, before footprints and other daily disturbances have interrupted nature's perfect work.